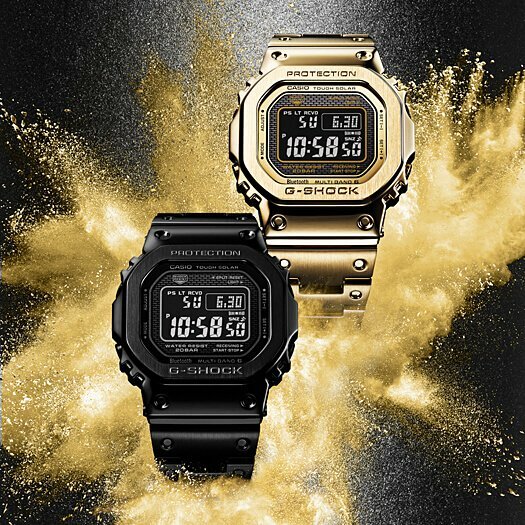 Latest Update: The GMW-B5000GD-1JF and GMW-B5000GD-9JF are 18 September 2018 releases in Japan with a list price of ¥68,000 JPY each. The GMW-B5000GD-1 and GMW-B5000GD-9 are also October 2018 releases in the rest of Asia. The G-Shock Japan listings confirm that these are ion-plated stainless steel models with STN LCD displays. The GMW-B5000GD series features Tough Solar, Multi-Band 6, Bluetooth smartphone connectivity, and screw-lock case backs with a DLC coating. For more information about the features see our original GMW-B5000 post. Update: Casio America announced the GMWB5000GD-1 and GMWB5000GD-9 for a November 2018 release with a list price of $550 USD each. 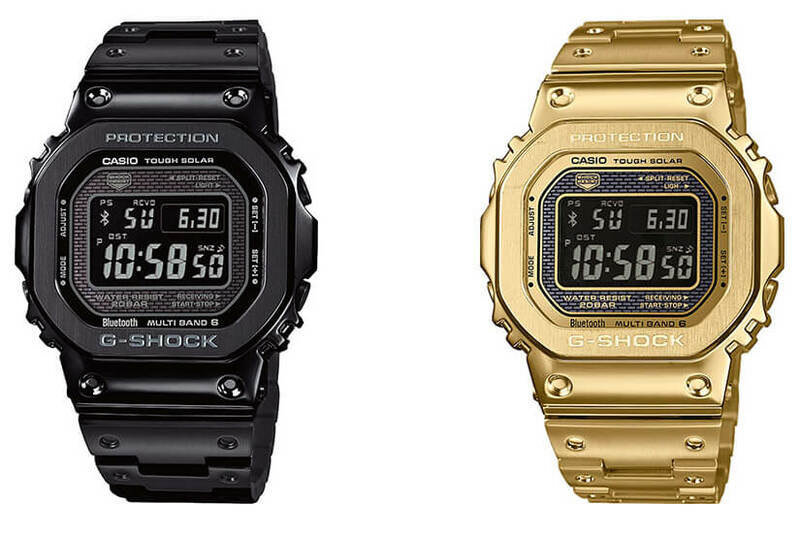 Update: Casio Europe revealed the black GMW-B5000GD-1 and gold GMW-B5000GD-9 along with official photos. It’s likely these will be October or November 2018 releases worldwide. The specs list the usual GMW-B5000 features and state that the bands are stainless steel. Most likely these are ion plated surfaces (judging by the prices) and STN LCD displays (like other GMW-B5000 models). The European model numbers are GMW-B5000GD-1ER and GMW-B5000GD-9ER. The final products in the official photos look similar to the unofficial “pre-production renders” leaked earlier, with the main differences being that the black GMW-B5000GD-1 now has gray bezel lettering and both watches appear to have an overall glossier appearance on the bodies. Both models have matte-like bezels with a brushed surface. 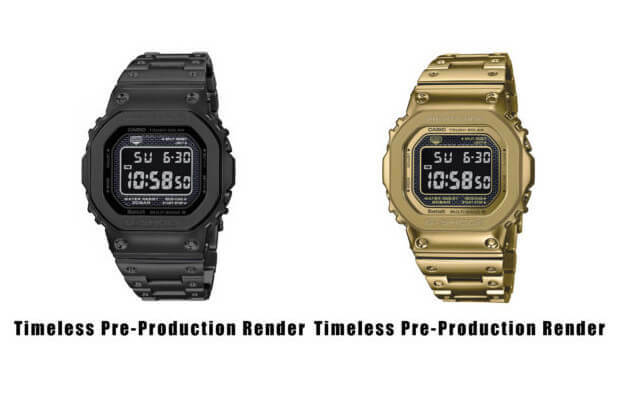 Texas-based Timeless Luxury Watches revealed two upcoming full-metal stainless steel square models, the black G-Shock GMW-B5000GD-1 and gold GMW-B5000GD-9, and is currently taking pre-orders for them. These ion-plated (we assume) models have a retail price of $550 USD each and are expected to be available in November 2018. The information here is based on “pre-production render” pictures from Timeless Luxury Watches and have not been officially confirmed. TLW is calling these “matte” models and the bezels appear to have a brushed surface. 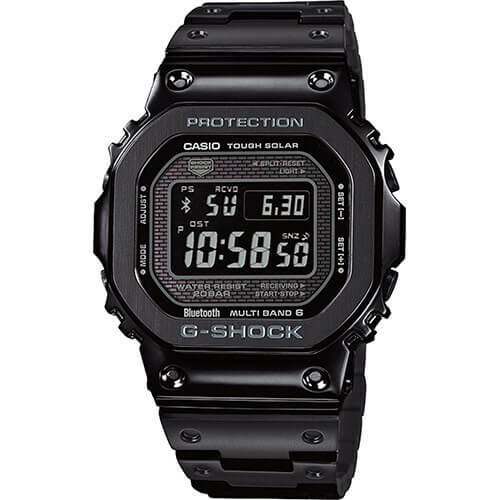 The G-Shock GMW-B5000GD-1 offers the stealthiest full-metal square option with a black IP coating on the case and bands, stealth bezel lettering, and a reverse LCD display. The display border has a darker appearance than other GMW-B5000 models. 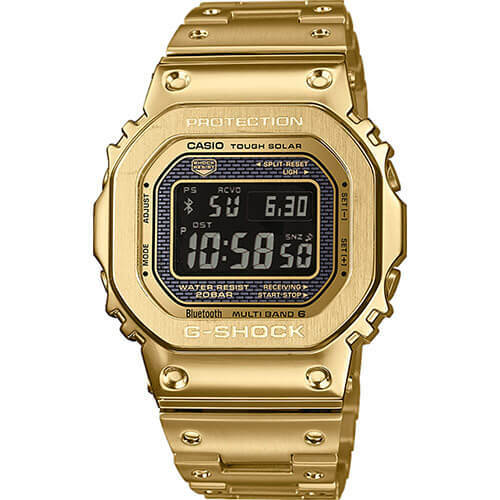 The G-Shock GMW-B5000GD-9 has a gold IP coating on the case and bands. Unlike the fully polished limited edition gold GMW-B5000TFG-9, it appears to have a brushed finish on the bezel, and a reverse LCD display. It appears to have a polished finish on the rest of the body and bands, but we’re not entirely sure about this. While some may bemoan the fact that these models have reverse LCD displays (because they are typically harder to read), keep in mind that the GMW-B5000 series is equipped with STN (super-twisted nematic) LCD displays that should provide better viewing than what we are accustomed to with regular reverse LCD displays. The GMW-B5000GD-1 and GMW-B5000GD-9 feature full shock resistance, 200-meter water resistance, Tough Solar power, Multi-Band 6 radio time syncing, world time, stopwatch, countdown timer, 4 alarms and 1 snooze alarm, and full auto Super Illuminator LED light. The GMW-B5000 series is also known for its Bluetooth connectivity to a smartphone which provides automatic internet time adjustment, 300-city world time with 5 settable cities, 5 custom reminder alerts, time and place log, phone finder function, and access to watch settings. Update: The pre-order pages and social media posts from Timeless Luxury Watches have been removed. Hi G-central will the B5000GD be Europe exclusive? will it release worldwide as I haven’t heard any new on Asia release. Thanks. I think it will be released worldwide. It looks like Casio Europe made a mistake in listing the watches so early as they took down the listings.